“Kiss your cold feet goodbye.” It’s the slogan that Paul McRoberts and his firm, iFH Designs and Installations, has used as a calling card since 1984. It’s a fitting expression because when Old Man Winter makes himself at home in their area for six months at a time, folks quickly experience the reality of cold feet. Most of Ontario lies in the lee of the Great Lakes, studded with rivers and watersheds. In these parts, frigid temperatures and abundant snow is only the norm come wintertime. Paul’s solution to the freezing-feet problem: radiant floor heating. The singular vision of iFH (which stands for in-floor heating): to create a well run, professionally managed and staffed plumbing and floor heating company providing expert advice, workmanship and knowledge. Paul McRoberts finishes a final wire check on the Taco variable speed Delta T 00 circulators at the Brennan residence. His customers, the Brennans, decided to go with an entirely floor-heated system and a lightweight concrete over-pour. A snowmelt system for the front porch and a radiantly heated garage were just icing on the cake. An 80-gallon Bradford White indirect water heater handles the domestic hot water need while 6,500 ft. of ½ inch PEX heats the home. In the mechanical room, the wall is amply decorated with Taco controls. The homes’ five zones are controlled by a Variable Delta T (VDT) pump and several Zone Sentry zone valves, all governed by a Taco switching relay. “The Delta T is great, because it dictates when it needs to be on a low or high speed. Anytime energy is saved, money is earned,” said McRoberts. Andrew Wilhelm checks the isolation flanges on the Taco variable speed Delta T 00 circulators at the Brennan residence. A Watts expansion tank was installed on the hydronic system and the domestic water lines are guarded by a Watts backflow pressure reducer. “Of course it goes without saying that, with the help of iFH, we were able to dismiss any chance of having cold feet,” said Mrs. Brennan. Brent McRoberts makes a final connection on a brass manifold to prepare for the startup of the new in-floor heating system. A recent renovation project sent iFH technicians to a 5,000-sq.-ft. farmhouse in London, Ontario. The home, having been in the Johnston family for three generations, was in dire need of remodel and renovation work, and was torn down. Only two walls were left standing. The Johnston’s decided to go with floor heating on all levels of the re-built home. McRoberts decided the best way to heat this farmhouse was to tackle the radiant challenge with three different in-floor techniques. Basement heat was installed in the new slab. The main floor and second floor piping was installed in joist spaces, while the attic was equipped with an over-the-floor radiant system. When all was said n’ done, over 9,000-sq.-ft. of PEX tubing in ten zones provided comfortable and efficient heat. The Johnston’s also received a Bradford White 80-gallon indirect tank to meet all domestic hot water needs. 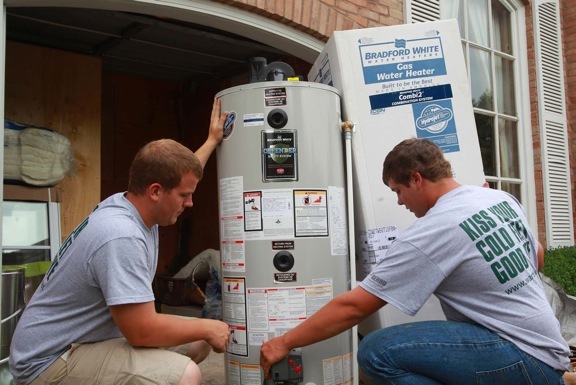 “We like using Bradford White water heaters, and have offered them to customers steadily for five years. They offer a solid, all-around reliable product line,” said McRoberts. Also on the Johnston’s project are three Taco iSeries mixing valves, connected to VDT circulators to control the individual zones. Because of their ease of installation and maintenance, eight new three-speed Taco 0015 circs supply for the extensive joist space heating system, concrete slabs and over-the-floor radiant heat in remodeled attic spaces. Two Taco 0013 circs control supply for the water chiller. They also installed ¾-inch Taco 418 air vents for noise-free operation of the upper manifolds. Taco SR506-EXP expandable controls are used for thermostats and pump wiring while two expandable Zone Valve Controls are used for the radiant manifold actuators. Both the switching relay and zone valve controls are expandable, giving the ability to add multiple panels together, all with priority. The first panel will then act as the master controller while any additional controls will act as slaves. “Among the manufacturers of hydronic pumpcs and components, Taco’s the leader of the pack,” said McRoberts. “They’re the only pump company that has all the products that we need. Every job we do is built with Taco technology; our mechanical room walls have an overall green cast for good reason. We need innovative solutions and products that work, without trouble, through long winter conditions. “We tend to use pumps for our zones, the iSeries mixing valves for our water mixing and Taco controls for everything from circulators to manifold actuators, whether they’re built for heating or chilled water,” he continued. In the old Stonybrook suburbs of North London, Canada, another renovation job beckoned the attention of McRoberts. The interior of the Cameron’s 1500-sq.-ft. ranch-style home had been completely gutted and was ready for a makeover. Previously heated with old fin-tube, hot water baseboards, an iFH Crew outfitted the Cameron home with in-floor heat. The ancient cast iron boiler was removed, as well as some of the radiators. An old, one-pump system was retired and replaced by a primary/secondary loop setup with four separate zones. A Taco 007 circ handles the primary, while a 003 handles the floor heat and remaining radiators in the basement, each served by separate thermostats. The home also had an electric hot water heater, so McRoberts removed it and replaced it with a Bradford White 40-gallon indirect. It’s now a natural gas boiler with a BTU rating of 110,000. It’s a mod-con as well. Specializing in hydronic in-floor heating is what makes iFH unique. 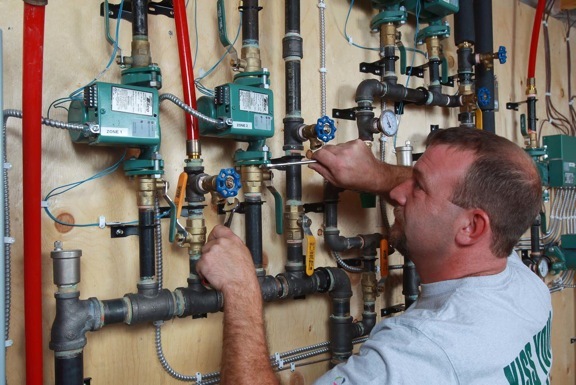 They’re the only company in their area that’s “obsessive-compulsive” about staying abreast of new product introductions and the steady training of all employees through the Canadian Hydronics Council. “We strive to go beyond customers wants and needs,” said Paul. Currently, iFH is based out of St. Mary’s, Ontario. The shop is a 2,500-sq.-ft. building with 500-s.f. dedicated to office space. New blueprints reveal the drawings for substantial upgrade: a new shop, offices and showroom adding up to over 7,000-sq.-ft. (all in-floor heated, of course) that will break ground in the spring of 2013.